Summary: You eyes need a substantial amount of moisture to avoid dry spots and potential damage. 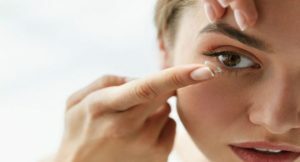 If you own contact lenses, you’re probably accustomed to the routine of putting them on and taking them out carefully, along with making sure they’re being handled with care and good hygiene. Because eye contacts are such a delicate piece of corrective equipment, it’s extremely important that you practice good habits. However, even if you handle them with care, there’s one thing you have to worry about – dry eyes. Here are some ways to moisturize without causing too much damage. Depending on your eyes, your optometrist will recommend specific types of eye drops for you. This can be anything from a heavily lubricated solution to a basic one that coats the eyes. Whatever the case may be, you’ll want to ensure that you use the exact solution that your doctor recommends. An alternative to eye drops is purchasing new lenses from a reputable supplier like Lens.com for example, that caters more to those that suffer from dry eyes. With new contacts, you’ll enjoy more comfort and less irritation that comes with dryness. Be sure that you consult with your optometrist prior to ordering new contacts so they can determine whether they are right for you. Wearing contact lenses for a lengthy amount of time can cause severe dryness. To counter this, you may want to take them off and wear your glasses. This allows your eyes to breathe and gives them a chance to recover from the strain that your contacts are putting on them.